Run Pass Option Clinic – Page 2 – The cutting edge of offensive football. The first RPO offensive schemes were stretched out versions of the triple option in the shotgun. When Urban Meyer was at the University of Utah from 2003 to 2004, I remember watching his offense with amazement. How could a coach in the 21st century run an option offense out of the shotgun? Fourteen years later, that offense seems antiquated. Coaches have pushed the curve with RPO more in the past five years than spread coaches had from the era of run and shoot offenses of the mid 1980s to the Air Raid offenses that dominated the late 1990s to the early 2000s. While Mouse Davis disciples to tweaked their run and shoot offenses over thirty years and the Hal Mumme protégés moved from the two back gun to one back and empty sets over twenty-something years, the RPO coaching community has pushed the boundaries further and innovated more in the past five years than any offensive scheme has seen in the history of the sport. The first major development that moved past the give/keep/bubble screen was the adaptation of quick game concepts to RPO run game. The major advantage of moving from screens alone to the addition of quick game concepts was simple: coaches could stretch the field from sideline to sideline AND vertically down the field. As long as the offensive line was engaged inside the expanded neutral zone. The neutral zone may be expanded following the snap up to a maximum of 2 yards behind the defensive line of scrimmage, in the field of play, during any scrimmage down. In simple terms, this means an offensive lineman can be within 2 1/2 yards of the offensive line of scrimmage before the ball crosses the line of scrimmage. Exploiting this rule has given coaches the freedom to combine run plays with pass plays like never before. A single receiver to the boundary is a dangerous weapon in the RPO game. Most defensive coordinators set their defenses either to the run/pass strength or the field. This means that quite often the solo receiver to the boundary is single covered. This creates an easy pre-snap read for a QB. Is the cornerback pressed or off? Is he inside or outside the solo receiver? Does he have inside flat help from a linebacker? Another route that is very simple to install to the single receiver side is the slant. The is another route that takes advantage of a soft cornerback with no flat help from a linebacker. Against a soft cornerback with linebacker flat help, the quarterback can ride the mesh and read the flat defender. If the flat defender comes up to play the run, the QB pulls the ball out of the mesh and hits the slant. 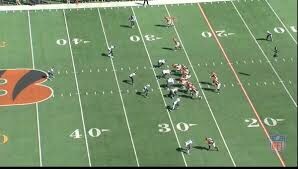 As you can see from the GIF above, Chip Kelly used this offense with the Eagles. Nick Foles rides the mesh then hits the slant in the open hole to the backside of the play. It is extremely hard to defend. Another route that is great against soft single coverage to the single receiver side is the out. The out is effective against both a cornerback in solo coverage or a cornerback with inside flat help. It is dangerous because not only does it take advantage of a cornerback in off coverage, it is a route that is hard to defend once the receiver has the ball in his hands. One missed tackle and the receiver can easily be up the sideline for either a big gain or a touchdown. This is a snap and throw route. If it’s there, throw it now. Many defenses will press a cornerback on the single receiver to the boundary. The idea is that a pressed cornerback can take away the short throws and a high safety on the hash mark can help over the top. Against pressed cornerbacks playing inside leverage, the receiver takes on outside release and restacks his route to shield off the cornerback. Against Cover 2 the receiver takes an inside release before restacking over the cornerback and working for width away from the safety. These four simple routes add a level of complexity to your RPO offense that makes it much harder to defend. One of the first developments in the RPO revolution was combining screen passes with shotgun run plays to spread the field from sideline to sideline. The idea was old school, yet new at the same time. If triple option football could combine a dive read off a first level defender and a pitch read off a second level defender, why couldn’t a spread offense combine on inside run read with a perimeter screen read? The reads were the same, but the scheme was different. The end man on the line of scrimmage would dictate run or keep by the quarterback and the second level read would dictate run or pass to the quarterback. It’s simplicity was the beauty of the play. The idea was nothing new, but the execution was entirely different. The question is, what screens work best with which run plays? How do you match a screen effectively with an inside or outside run play? How do I make the defense account for every player on the offense? Which defenders do we want to isolate to create a pass read? Can we replace a blocker in the run game with a receiver in the pass game? The first question is one that many coaches don’t consider when game planning for an opponent. This is an important question because creating an advantage for an RPO offense is dictated by working the numbers for an advantage: either in the box or on the perimeter. In the days when 21 personnel reigned supreme in high school and college football, the fullback usually accounted for the defender that the offensive line didn’t have the numbers to block. To start, let’s examine a play that every coach who’s used the I formation has run: the weak side Iso. This is one of the most basic offensive run plays. The offensive line blocks hat on hat, working first level double teams to the linebackers. The fullback attacks the linebacker in the weak side bubble. There are seven blockers for the seven man box. The extra player is the running back, who follows the fullback through the hole and attempts to make the third level defenders miss if/when he breaks through the second level. How do we translate a play as simple as the iso to spead RPO offense? We still isolate the Will linebacker by moving our R out to the slot. Instead of isolating a LB with a blocking fullback, we move him into a position that forces him to make a decision on the snap: am I going to play the pass or am I going to play the run? The blocking for inside zone is virtually identical to the I back Iso play. Now on the mesh the quarterback reads the Will linebacker and if he plays run the quarterback throws the bubble. If he plays pass the quarterback continues his mesh and gives the ball to the running back. Instead of having a give/pass option, now we have pass/pass/give/keep options. Their are four possible plays available just by spreading the defense out with additional receivers. First of all, coming up with six to eight screens that work to isolate a run/pass defender is the best way to start. Do we have a trips bubble screen? A trips flanker screen? A 2×2 bubble screen? A 2×2 flanker screen? A fast motion screen? How do we use these screens in the game plan to pick a defender to place in conflict? If the Will LB slides out of the box, we run the ball. If the Will LB stays in the box, we throw the ball. The concept is identical to the above inside zone concept, yet we give a new wrinkle to the defense using fast motion. Noel Mazzone used this type of motion throughout his stints as offensive coordinator at Arizona State and UCLA to great success. This type of perimeter screen isn’t limited to inside zone. These are just a few basics. How you control the perimeter with your screen game really depends on how creative you want to get, identifying the box defender you want to isolate, and complimenting your base run game by removing a lead blocker and replacing him with a receiver running a screen. So you’re an old school, smashmouth coach who wants to run the football, but all of these new, young coaches are slinging the ball all over the field. You like to run power, counter, and toss out of the two back sets. How do you incorporate your preferred style of offense with the new run-pass-option concepts that have become popular in the past few years? Here are some ideas that can keep you old school, with a splash of what the new generation of coaches are doing. Coaches like Urban Meyer and Gus Malzahn have been at the forefront of revolutionizing the ideas of a two back power offense, with enough spread concepts integrated to keep defenses from stacking the box. In this set, we have the traditional fullback and tailback, while incorporating three wide receivers to stretch the field from sideline to sideline. Out of this personnel grouping, we can run inside zone, power, counter trey, and counter GT. This gives us the ability to be smashmouth and pound the rock, but still prevents the defense from stacking the box. Power is the first and best play that most coaches run out of a two back set. This play can be effective from youth football all the way to the pro level. Since this play is so commonly run by coaches at all levels, we will discuss the RPO game off of power. When the QB comes to the line, the first thing he checks is the backside solo receiver. Is the cornerback playing soft? 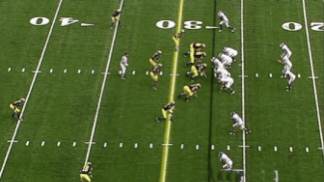 Is there an overhang linebacker covering the weakside flats? If he has grass, this is a snap and throw now. If he doesn’t have a look he likes to the solo receiver side, he will check his slot receiver. Do we have favorable numbers to the two receiver side? If the flat defender is apexing the tackle and the slot, our slot has the advantage and we would throw this now. Many defensive coordinators will roll to a Cover 3 look against 20 personnel. We still want to be able to run power vs. eight defenders in the box. We will attack a Cover 3 cornerback short and out of the range of the flat defender with a speed out to the short side of the field, and attack the wide side of the field with the bubble screen. If the play side overhang is apexed between the play side tackle and the slot, we will throw the bubble screen. 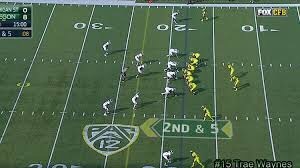 The idea for this concept is to control the flat defenders to give us a six man box to run against. If the Will backer is playing the flat and the backside cornerback is playing off, we will cut the splits of our X and throw the quick out in rhythm on the snap. If the cornerback presses, the quarterback will look to the bubble screen before the snap. If the overhang to the two receiver side is head up on the slot, we’ll proceed to the run.